Ice racing is a sport which involves the racing of motorized vehicles on predominantly natural ice surfaces like frozen lakes or rivers. Several types of vehicles are used for races, of which the most common are automobiles, motorcycles, snowmobiles and ATVs. The sport is mostly conducted in the northern parts of North America and Europe. The tracks used for races vary - it can be a quarter mile to one mile oval, or can be road courses that are several miles long. Races are conducted on flat icy tracks as well as on dirt tracks, which has a thick snow cover on top of ice. Races are divided into two classes based on whether vehicles are allowed to use studded tires are not. Ice Speedway or Motorcycle Ice Racing is popular in Russia, Sweden and Finland, where the Team Ice Racing World Championship, the most popular motorcycle ice racing competition, is held annually. The competition features races of various distances for both studded and non-studded classes. Car Ice Racing is very popular in France, where an annual Trophée Andros series is conducted. Besides this, only a few other official races are conducted elsewhere in other countries. Most other car ice racing competitions are small, conducted at a regional level, for amateurs and recreational drivers. 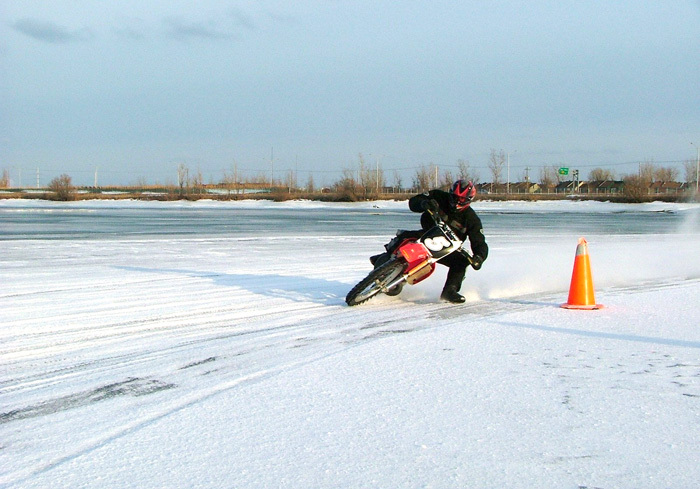 Ice Speedway — similar to Speedway Racing, though using bikes developed specifically for racing on ice. The bikes race anti-clockwise around oval tracks between 260m and 425m in length. Car Ice Racing — cars race across a strip of frozen water. Snowmobile Racing — riders on snowmobiles compete on purpose built courses or on natural snow-covered terrains.